09.22.2007 - This photo was sent to me by my brother-in-law Sean, who I trained, and who now operates his own wildlife removal business in Seattle, WA. It's of a giant Norway Rat, or "hog rat" as he called it. I've gotten some very large rats myself here in Orlando Florida, but none as big as this beast! Norway Rats are, on average, larger than the Roof Rats, or Black Rats, that I deal with. Most striking to me is the short, fat tail of this Norway Rat. Roof Rats have very long, black, sleek tails that are longer than the body length. This is probably because Roof Rats require more balance (that's what a tail is for, by the way), when they are jumping through the trees and running across power lines. I can't see this fat fellow pictured above nimbly jumping across branches and running up walls. Though it probably could. Rats are amazingly nimble creatures. Sean caught this giant rat in the basement of a home in Seattle. That's another difference between the rats - giant Norway Rats like this tend to live below ground more than Roof Rats do. This fatty apparently couldn't get enough food, because it went for the bait on Sean's trap. Luckily, the rat traps that we use are strong enough to kill even a rat of this size instantly. Sean was amazed at the size of this rat, especially after he dealt with the svelte rats of Orlando, so he measured it and emailed me this photo so that I could see for myself the size of this hog. Tips on catching giant rats - The best tips for catching giant rats have universal application for most rodents within the home. Catching rats is not effectively done with poison. Poison, if the rats even eat it, will only result in dead rats decaying somewhere within the building. The time and effort that goes into finding dead bodies and removing them would be better spent in setting up snap traps around the infested area. Before any rats can be trapped and removed from the home, the outside of the building needs to be repaired. The small holes and gaps in your home serve as doorways for rodents to enter the interior of the structure. If you do not seal these gaps, mice and rats will continue to invade during the trapping process. You will not be able to eliminate rats until the holes are sealed. Rodent waste and the bodies of dead rodents will create a tempting odor, drawing in other nuisance pests. When the home is sealed, the traps can be effectively set. Setting the traps is the easy part. Finding a good location for the traps requires some detective work. 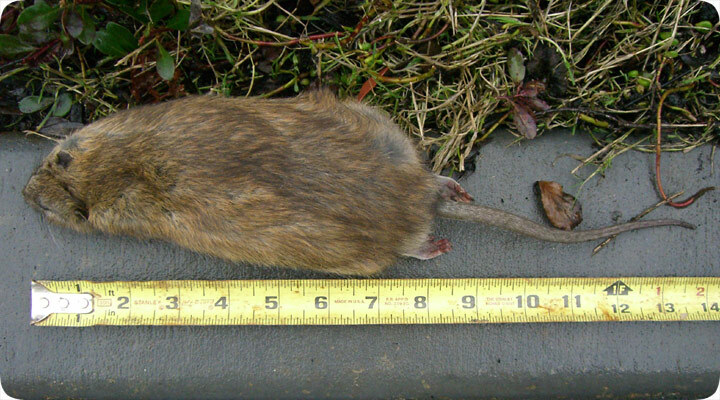 Giant rats will leave urine and large feces in areas where they frequently visit. It may go against your better judgment, but placing traps in these areas without cleaning up the excrement is a good tactic for successful trapping.